It is always nice to get some character development in any series, and this is especially so when the focus of a series is on “slice of life” elements like many of the stories serialized in the Kirara manga variants. 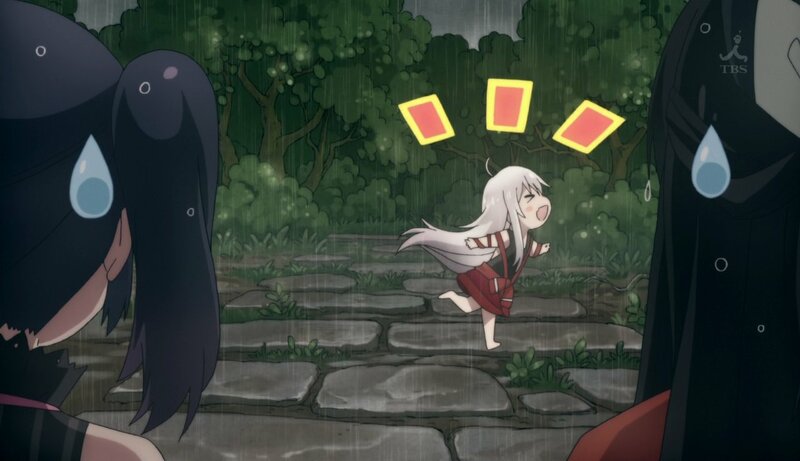 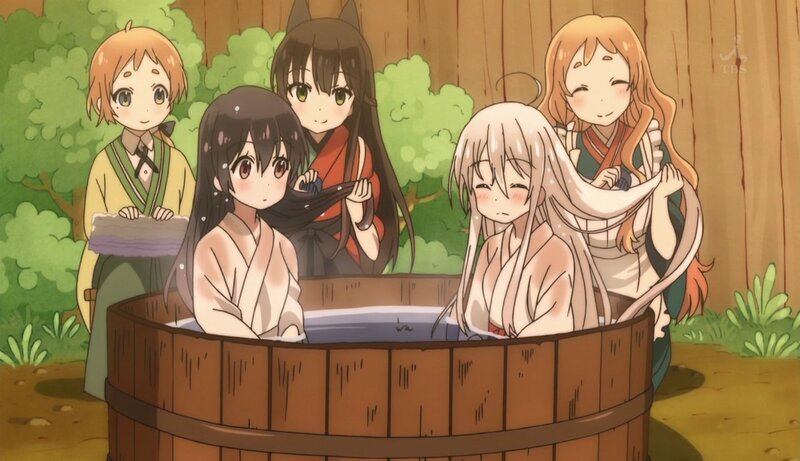 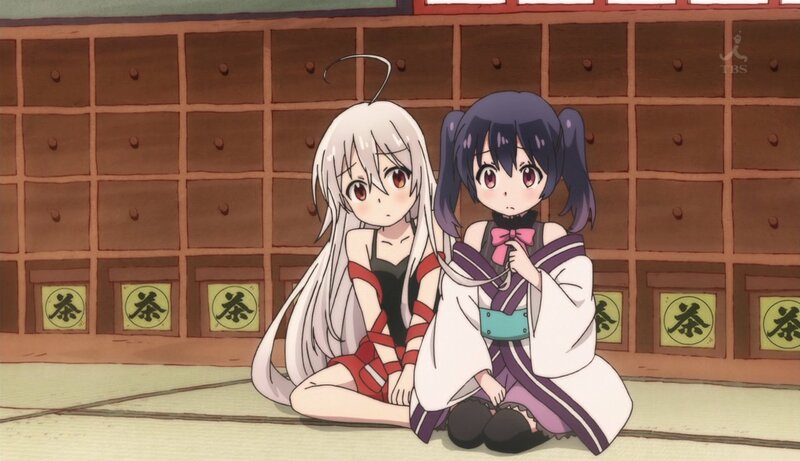 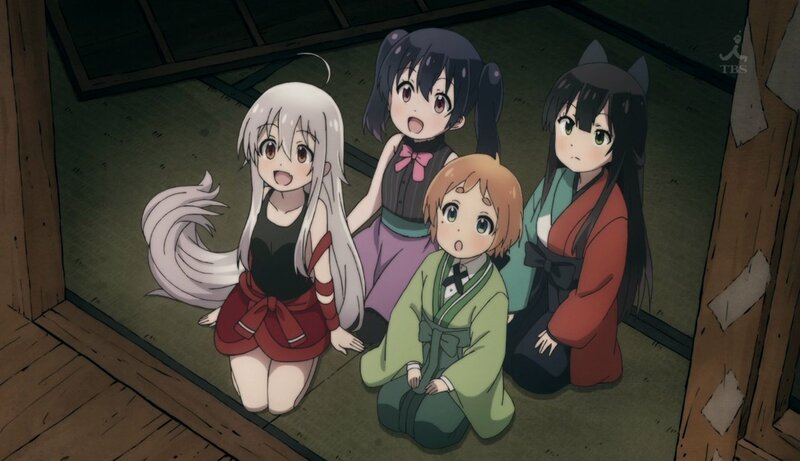 As mentioned earlier, Urara Meirochou is a little different, as it has a much more detailed setting and a more specific storyline as well, in the sense of there being a very clear and specific direction towards which things are headed. 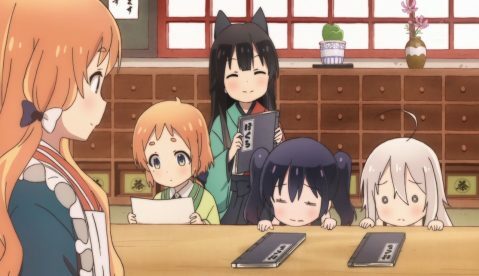 (Other Kirara series without such elements ply their trade much more closely on character development – like Gochuumon wa Usagi Desu ka and Kiniro Mosaic, for example.) 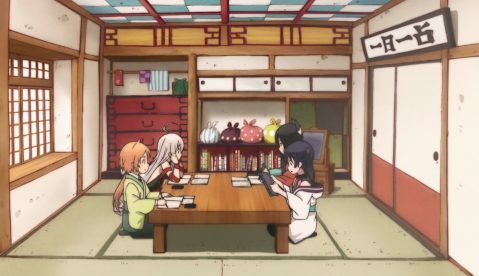 After episode three aired the narrative took a slightly different turn from that of the first two episodes, which were largely introductory … a sort of portrayal of the cast coming together as a group followed by outlining the setting and the main focus of the story. 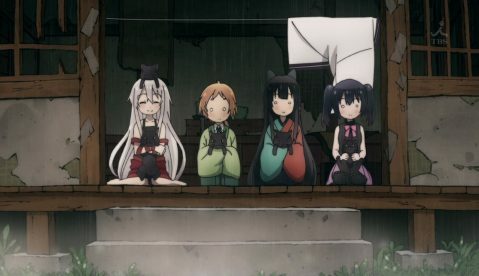 Episode three felt like it was simultaneously doing two things: letting the “camera” focus a bit on one of the important “side characters” (in the sense of the close circle of those around the main character of Chiya) while at the same time showing a little bit of the impact Chiya has on them personally. 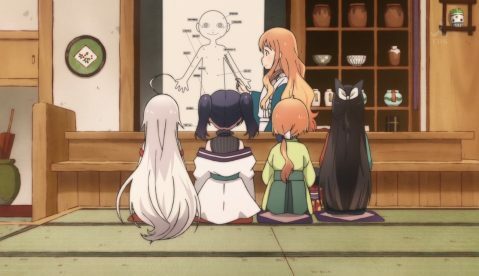 In doing this we sort of learn both about the character and about Chiya at the same time, but through different sets of eyes. The mini arc focus on the characters begins with Kon. The context is with the young girls’ mentor Nina having ordered a special bowl for her divination (called the “Famille Rose Nine-Pear Bat Bowl”, no less) that has apparently just arrived at the store she ordered it from. 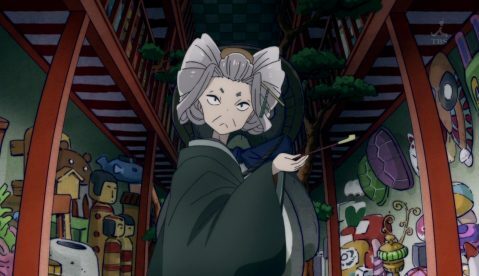 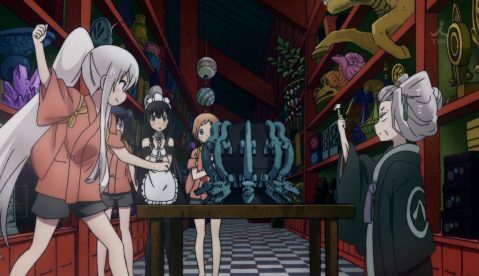 The immense store (named Benten’s Divination Supplies) itself is in the 10th district, meaning every single Urara in the city can obtain things from it – no wonder the tenth distract seems packed with storefronts. 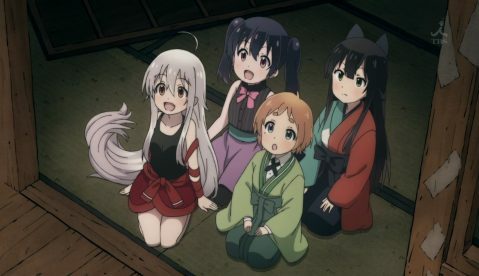 Because of the size and the colossal stock the store houses the store and it’s owner (named Benten) are rumored to be extremely influential in Meirochou proper, and Benten herself even has a bit of a reputation, some saying that she is a mastermind who owns many of the Urara of the town and has great influence, both on an official level, and on an unofficial level, having great influence in the black market and being a master gambler as well. It is in the store itself that we see aspects of Kon we did not know before … she is extremely educated and knowledgeable, yes, but also has an encyclopedic mind and passion for divination items. 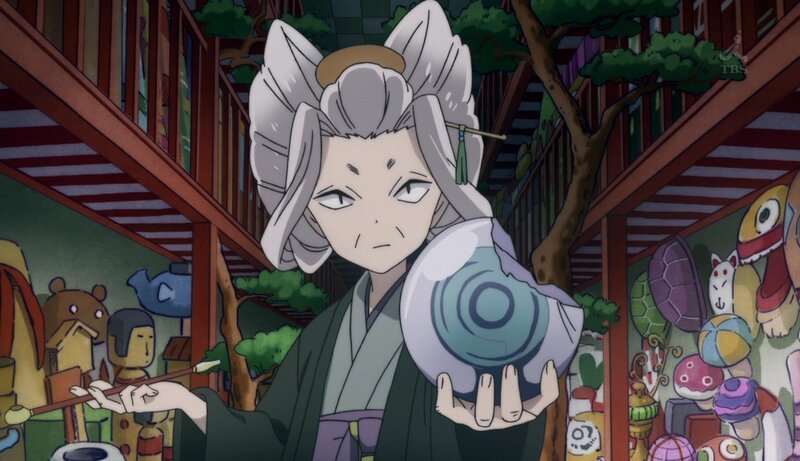 When she accidentally breaks one of the shop’s items Benten ropes them into working for her to begin to pay it off – this is where Kon’s effectiveness as a saleswoman about the store’s contents fully comes into the forefront. The girls agree, but when it turns out that Benten may take further advantage Chiya puts her foot down and confronts Benten, and does not back down. 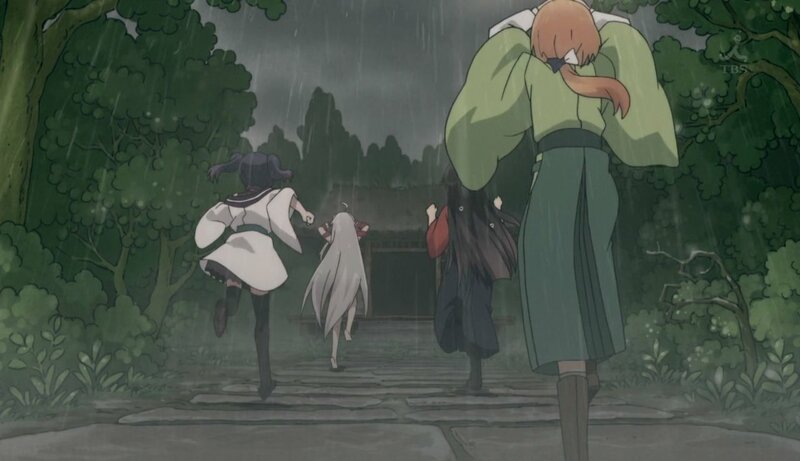 The whole sequence at first glance seems to show Benten to be a fairly disagreeable character, but after musing over it I came to the conclusion that Benten was actually putting them through a stern test to see what their resolve was. 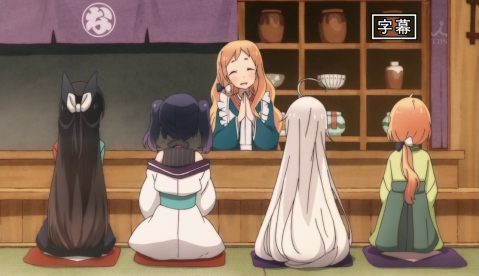 And it was Chiya who not only first stood up to her, but also put her money where her mouth was, so to speak. 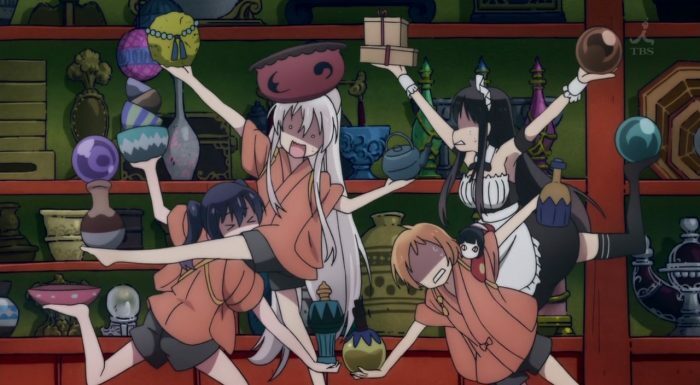 As a result the girls obtained the “legendary bowl” for Nina and head back to Natsume’s Teahouse. 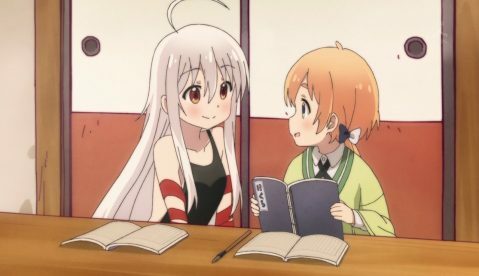 The second half of episode three turns it’s focus onto Koume. 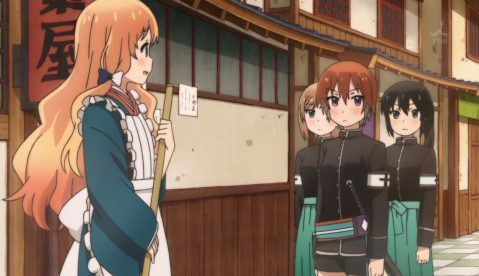 Of all the girls, Koume is the one most aware of and immersed in “Western divination” and magic and such – she likes witches, tarot, flying on broomsticks, etc., but she also loves “nice European clothes”. By some turn of events Chiya’s incredibly long hair gets inextricably entangled with the shirt buttons of Koume’s sleeveless under-garment thingee. When it is suggested that they simply cut Chiya’s hair she freaks out in feral fashion to everyone’s surprise. Later on despite the inconvenience Koume sees Chiya really is being unusually stubborn about not cutting her hair, and realizes that she really knows almost about Chiya as a person at all, and finally decides to damage her beloved clothes, ripping the buttons off of her shirt rather than insisting on Chiya’s cutting her hair. 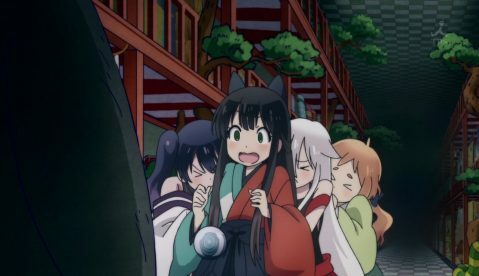 On later learning the reason for Chiya’s resistance Koume is even more shocked – Chiya’s life experiences are surrealy different than her own. The final character of the main group to come into the spotlight is Nono – the gentle and timid yet creepily occulticly inclined younger sister of Nina. When she flunks a written test (Chiya and Koume fail as well – only Kon aces it) even though making efforts to study she sort of takes a tiny first step of trying to set out on her own and do things with others and not really on her older sister as much (which is a surprise to her older sister as well). Interestingly as events unfold and a self study session begins (dedicated to divination through finding out where moles on a person’s body are? 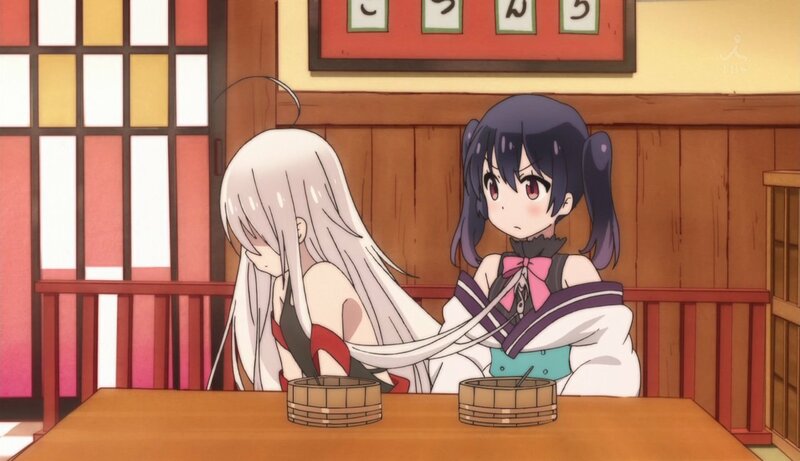 Wha?) we see both Nina and Nono both encouraged and comforted by others with this new step and learn a little bit about their family dynamic in the process. 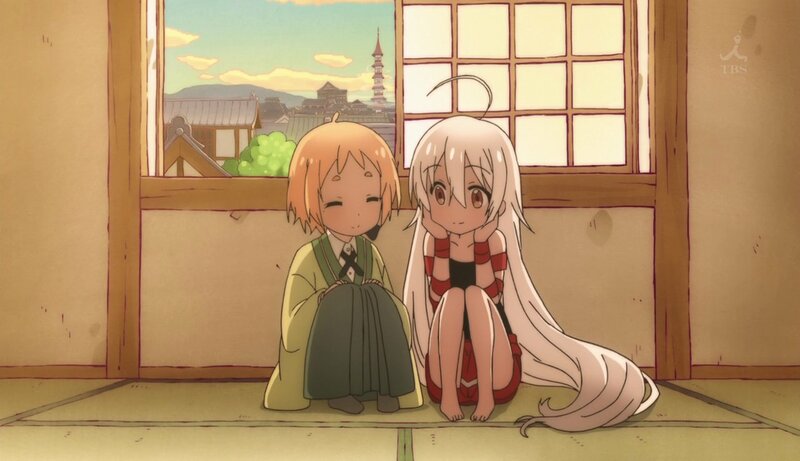 Saku on patrol drops by and listens to Nina, but it is Chiya who tries to cheer up Nono and encourage her in her attempt. 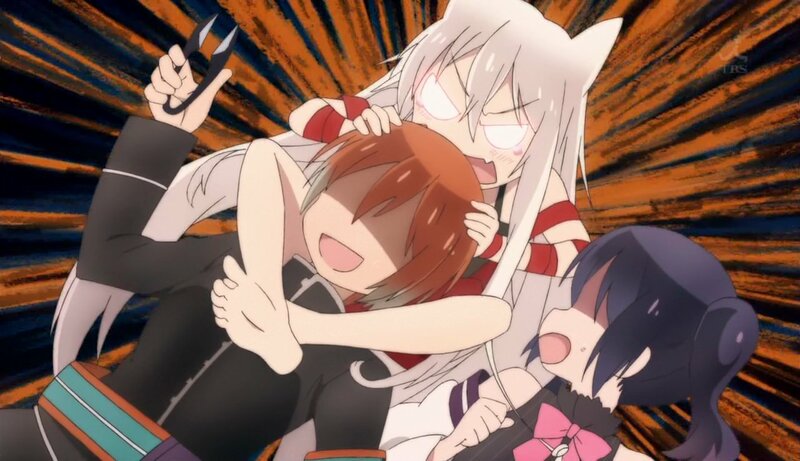 One really does see that the two sisters really do love each other and are very close as a family. 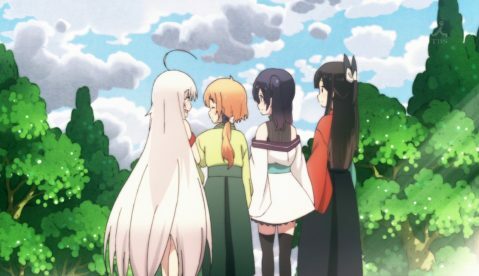 When the ED song for the episode was showing I found myself lost in thought about the content of the last two episodes proper and before I knew it the preview for the next episode flashed across the screen. And I was quite surprised. It looks like the next episode is a common event in the lives of Urara in general (and perhaps an indication of moving from the tenth to the ninth level? 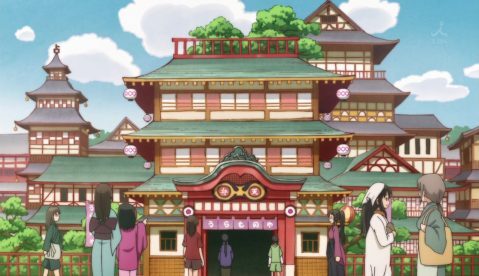 Just a guess…) where some kind of ceremony takes place in formal attire when the young Urara are somehow “wedded” to the deities of the city? 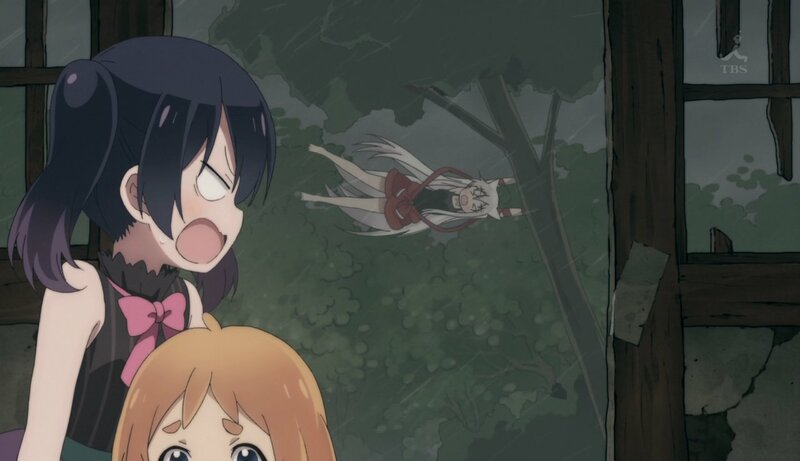 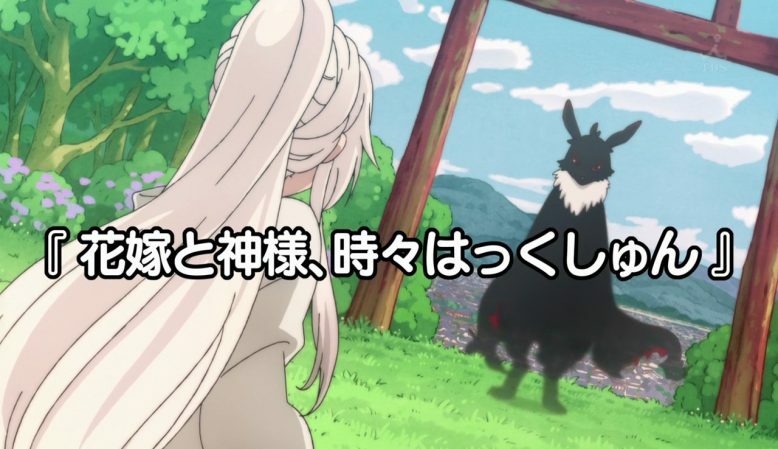 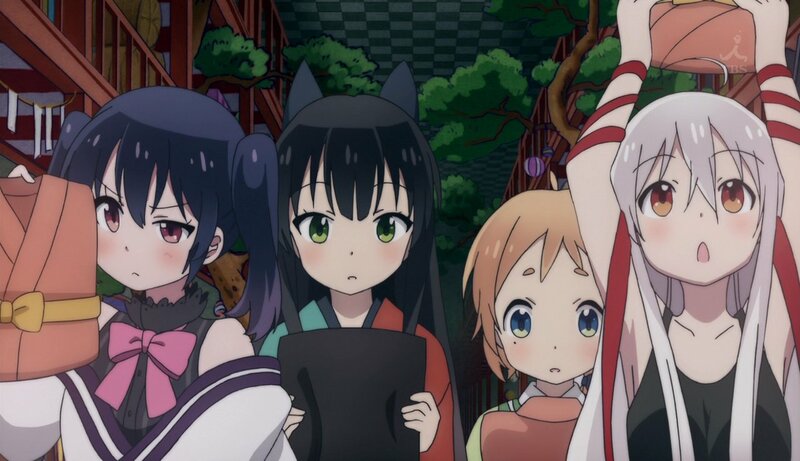 The last moments of the preview show Chiya looking directly at the rabbit headed, shadowy form that has shown up in the OP behind Chiya – apparently she can see this (I presume) Meirochou deity, and the words regarding the special Urara who can see and hear the gods that Kon’s mother told her about (in episode two, if you all remember) seem to be showing that Chiya is indeed one of these special people. Very much looking forward to seeing what happens next episode! Next episode is titled “Brides and Gods, and sometimes Achoo.” Very telling with this preview image….